Should you ever have an FDA inspection, you’re going to want to know what to do after.And if you’re a medical device company with class II or class III products registered with FDA, you need to be prepared for an FDA inspection. Technically, FDA is mandated to inspect any company with class II or class III products every two years. Yes, I know. You don’t really think FDA is going to show up. Maybe they won’t. But if they do, don’t you want to know what to expect? You should. I’ve written previously on how to prepare for an FDA inspection. Once you have that dreaded FDA inspection, you should know what will happen next. You’re probably going to receive 483 observations. If you get 483 observations, does this mean you’re also going to get a warning letter? Not necessarily. The reality is that the decision is not up to the inspector who visits your facility. Whether or not you get a warning letter is determined by the FDA Office of Compliance. Realize that the way FDA operates is by a process of escalation. An FDA inspection leads to 483 observations. If 483 observations are significant enough and/or you do not respond accordingly, then you should expect an FDA warning letter. FDA 483 observations should be taken very seriously and should be addressed and responded to thoroughly. Then if you do happen to get an FDA warning letter, you absolutely MUST respond and correct the issues. Otherwise, expect increased escalation from the agency. You could end up flushing $400,000 or more down the drain fighting FDA. Or worse, you could be shut down. 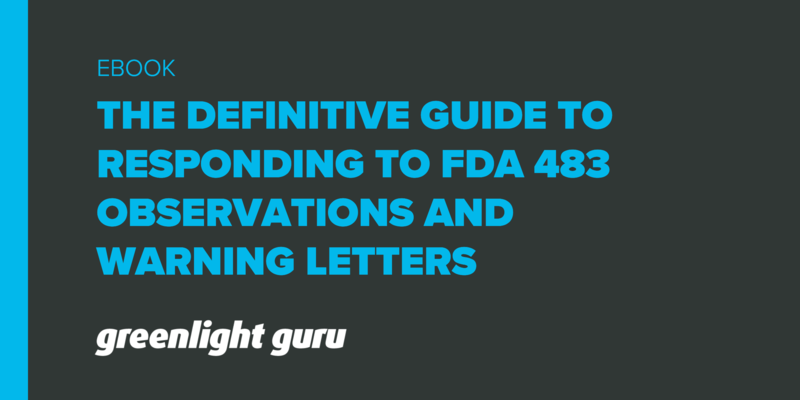 In the rest of this guide I go into great detail regarding exactly how to respond to FDA 483 observations and warning letters. Bonus Resource: Click here to download your free PDF of FDA 483 / Warning Letter Response Template. What Is an FDA 483 Observation? An “observation” in an FDA 483 is an observation about a condition that FDA considers significant and that relates to an observed or potential problem with the company’s facility, equipment, processes, controls, products, employee practices, or records. “Potential problems” should have a reasonable likelihood of occurring based upon observed conditions or events. When appropriate, an FDA 483 observation may refer to inadequate situations as long FDA provides facts (examples) or explanations that support or explain why FDA considers the observed condition, practice, or procedure to be inadequate. When you get FDA 483s, you need to respond and do so within 15 business days. The content below describes how and what should be included in your response to FDA. These details are applicable whether you’re providing a 483 response and/or a warning letter response. It is important to anticipate and be mindful who at FDA will be reading your 483 response. The FDA inspector and the FDA District Office are only the first step in the review of the 483 response. The ultimate audience reviewing your 483 response will be officials from FDA headquarters. This is the ultimate audience that must be convinced of the adequacy of the response and the proposed actions. In order to be persuasive, your 483 response needs to contain clear, factual, well-supported descriptions of events, systems, procedures and data as relevant to each observation. The FDA reviewers of your response want to understand why your product(s) that are subject to 483 observations, and that are still on the market, are and remain safe and effective. You need consider whether the issues underlying the 483 observations have any adverse impact on the safety (or effectiveness) of the product(s) at issue. If any such impacts are found, the 483 response should promptly communicate to FDA the impact to the product(s). You should ensure that the 483 (or warning letter) response is responsive to FDA’s observations, is easy to follow, and leaves no doubt with the FDA reviewer how and what you are going to do to fix the issues. Each response must address the central issue(s) raised in the observations and provide factual objective evidence that permits evaluation and aids in understanding of the response. All the information needed to answer an observation can be contained in a narrative presentation that is easy to follow and that permits you to structure the answers in a way that places the your company in the best light. If you dispute the 483 observation and you support this with factual objective evidence, then it is appropriate for your 483 response to point this out. Whatever your conclusion is about the observation, the response should not simply ignore FDA’s claim. Your response should provide the facts and explanation needed to explain why the observation is not wholly accurate. You should always support your claims and response to 483 observations with facts and data. Avoid unsupported, unexplained assertions because they are of no value to FDA’s analysis of the response. The quality and thoroughness of your 483 response is very important. If the FDA reviewers are not on board or if your response is not properly supported, this is fodder for FDA to escalate your issues to a warning letter. Define a list of the actions that either will be or were accomplished for each FDA observation general heading and specific example. Below are typical examples of actions that will be responsive to FDA observations. Determine which of these items are applicable and appropriate. Provide information to FDA in a manner that is easy to understand and navigate. Guide the reviewer. The content below is best understood when reviewing side by side with the template. Determine who will be the primary point of contact and signing your response letter. The signatory is customarily the most responsible person at the site. Define the planned response timeline (i.e. once per month or every 6 weeks). The beginning paragraph should explain that you are providing the completed and planned actions the company has taken and will take in response to the FDA 483 observations in this appendix. Provide an explanation of the layout of the FDA 483 observations and the company’s responses. It should also introduce the other appendices and explain what information they will contain. In the text of Appendix 1, list each FDA 483 observation word for word before your response. Be certain to first respond to the general statement, and then to the specific example. You should consider inserting a response immediately following the general statement and provide as attachments the evidence to support the response. The response to the observation should then continue to the part of the observation in which the investigator provides a specific example. Below FDA’s example, the response should contain your response to that portion of the observational finding. The purpose of your whole response is to demonstrate that you are taking the observations seriously and that your company is taking necessary actions in a timely manner to correct the issues. It is a best practice to separate the actions that have already been completed from those that are planned. This enables the FDA reviewer to be persuaded that actions are being taken, and there is movement within the company to address the issues the FDA inspection revealed. Use the “Response” section in a flexible way. It can be left blank, used to reference the reader to Appendix 3 or another section of the response, or used to explain supporting facts that may attenuate the FDA 483 observation. In the “Completed” and “Planned” sections, enter the actions or commitments. If there are no “completed” actions, then delete that row of the table. Similarly, if there are no “planned” actions, then delete that row of the table. Even though FDA policy is that observations should not be repeated, it is very common for the same event or set of facts to be listed as examples in multiple FDA 483 observations. Despite this, you should avoid being repetitious in your response, and instead should simply reference the reader to the prior response where the relevant actions (either completed or planned) are discussed. FDA policy is that the observations should be ranked in order of significance (from most extreme to least extreme). The earlier observations in a section are considered by the FDA investigator to be of greater relative importance than those that follow it. Keeping this in mind, plan to complete the actions promptly, and assign completion dates in accordance with this priority. Systemic Correction(s) to the underlying problem(s). Corrective Action(s) for the specific example(s). Steps taken to identify, examine and correct of any other examples of the same type of problem not specifically found by FDA. Any actions taken that impact product which has been manufactured. If there is no impact, describe how this was determined. Any interim corrections or measures taken to assure compliance until permanent corrections can be effected. Timelines for the corrections. Be realistic and establish a schedule that shows urgency. Attachments (documents or records) that demonstrate that any action taken or reported as accomplished was actually implemented. This may include copies of updated procedures, copies of data collected, reports or summary reports, etc. The volume of documentation should be selected so as to provide the minimum information necessary to prove to FDA that the action was implemented, while also providing to FDA what FDA will expect to see. If you disagree with an observation, provide objective evidence to demonstrate to FDA that the investigators were incorrect. For Appendix 2 - List of Attachments, use a table format containing the number of the attachment and its title or description. Provide evidence that the FDA reviewer expects to see. This evidence includes procedures, training records, protocols, reports, memoranda etc. No matter what the FDA investigation branch personnel may say, FDA has been critical in warning letters when a company did not provide documents that support the company’s actions. The person assigned to collate the response should confirm that the attachment number in this list agrees with the number in “Appendix 1 - Body of the Response”; the title/description in the table matches the actual attachment that will be issued in the response; and the number of pages is entered into the table. For Appendix 3 - Table of Actions/Accomplishments, use a table containing the number of each FDA 483 observation (or warning letter observation) and a brief description of the completed and planned actions. As you provide FDA with updated responses each month/quarter this appendix should contain the entirety of actions accomplished. It is a useful tool to remind FDA of the set of actions completed and it provides a history for the site personnel who host the follow-up inspection. Use this table to capture the list of actions described above “Make a List of Actions.” An example of a Table of Actions/Accomplishments follows. I recommend that the subject matter experts be assigned to complete this table for the items assigned to them. The manager responsible for the product or process should confirm that the actions completed and planned are factually correct as detailed in the table. All the steps described above are applicable whether you’re responding to 483 observations or warning letter observations. Understand that if you receive 483 observations, you may or may not receive a warning letter. When you get 483 observations, take these very seriously. And respond to the 483s appropriately. Do so within 15 business days and get on the necessary path to mitigate and correct the issues identified. At the chance you do receive a warning letter, there is a very good chance that the items cited in the FDA warning letter will not align one to one with the 483s. Be organized and coordinate 483s with warning letter observations. Structure your response accordingly. When communicating with FDA regarding 483 observations and/or warning letter issues, follow the format described above. Provide frequent updates until the matters are resolved. And if you tell FDA you will provide an update or complete an item by a certain date, be sure that you do so by the date you specify.